Lately, my mailbox has been stuffed full of credit card offers. To be honest, I haven't done anything about it because I'm actually in the market for a shiny new credit card. Hopefully one with a fat signup bonus, and a decent rewards program. So I'm ok with the credit card offers. What I'm not happy about is the constant stream of solicitations for refinancing my home loan, switching my car insurance company, and changing my TV service. At some point, it needs to stop. Not only because it's annoying and wasteful, but also because it can be a bit of an identity theft risk. DMAchoice: Use this site to opt out of direct marketing campaigns. While you probably won't stop everything forever, this site can really help you slow the trickle. 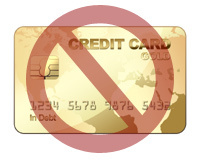 OptOutPrecreen: This site is all about opting out of prescreened credit card offers. If you want to stop receiving offers for loans and credit cards, you can use this site to reduce your junk mail from that quarter. Even though it seems as though the junk mail industry is one of the few things helping the USPS stay even remotely in the game, that doesn't mean I want to keep receiving that stuff. It's frustrating to have to wade through it all, and shred it. As result, I'll soon be heading them off. While there is no completely full proof way to avoid having your identity stolen, you do need to do what you can to prevent identity theft. One of the ways to do that is by reducing the amount of information about you floating around. Stopping junk mail can also help. These days, it's all about information. Restricting your information can be one of the ways that you can reduce the chances of being a victim of identity theft. When you do receive marketing mail — especially if you are receiving prescreened credit offers — be sure to shred them. You don't want to throw out something that someone else can use to pretend to be you. If you are tired of receiving junk mail, and if you want to do your part to live a greener lifestyle, you can put a stop to a lot of what appears in your mailbox. And it just might help you protect your identity as well. Yes, I opted out years ago. Now I would like to stop the medicare solicitations now that I am 65 years old.